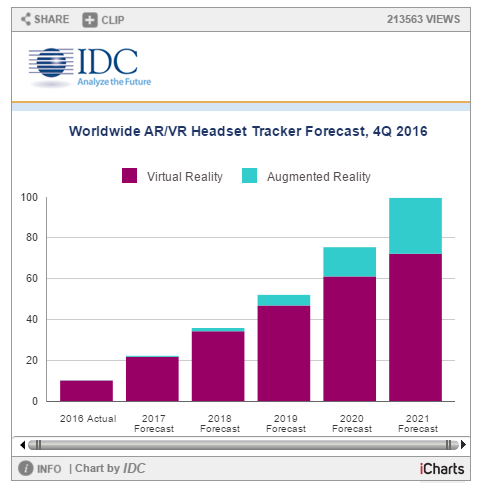 IDC, which publishes research on technology, recently let loose some PR around their Worldwide Quarterly Augmented and Virtual Reality Headset Tracker product. The news, which is interesting in light of the deflate in the VR industry at the beginning of 2017, expects ~100 million headsets shipped per year in 2021. Their report is for advanced headsets costing several hundred dollars, so their prediction is quite significant. They also expect that AR (aided by the arrival of new headsets (like vaporware Magic Leap) to take a larger percentage of the market. It should be noted that current sales of VR headsets at the beginning of 2017 are in the low millions. Commitment of larger vendors to VR. For example, HTC is actively selling its smartphone factories and investing the profits in their HTC Vive division. Addition of haptic devices. Its easier to create a motion controller than a headset, so there is a steady stream of announcements for haptic gloves, VR chairs, even full body suits. 360 cameras are apparently even easier to create, and there are lots of ‘solutions’ that put a 360 lens onto a smartphone (though unless that smartphone is tethered, you’re going to ride the vomit comet). Alternative headset models – while the AR motorcycle helment company Skully is no more, vendors are identifying places where people already are willing to wear headsets. One can question the wisdom of this approach. Current smartphones are at the low end in their ability to display VR – it is easy to design a scene that overloads even the fastest processors in GearVR and Google Daydream/Pixel systems. The real problem with all this activity is that it is currently focused on a reference platform which is just barely adequate for VR…if you have the motivation to use it. Gamers, have been buying VR experiences, though at low levels. But the general public isn’t willing to shell out the $$ when the headsets are big and clunky, tethered, and most importantly, fall short of a true immersive VR experience. Nearly all VR devices today sport about 100 degrees of view. While you can put together a reasonable VR experience with this FOV, it is not truly immersive. Unless you keep your eyes directed forward, you rapidly see the boundaries of your VR ‘cage’ and the illusion is lost. Coupled with blurry edges, the ‘screen door effect’ (you can see the pixel edges as a faded grey screen over the image) and motion sickness, there’s not really a ‘there there’ for consumers. Current VR and AR headsets will be great in industry in certain applications, but the Hollywood movie version of VR doesn’t exists. FOV is a big issue. Amateur astronomers are rightly proud of showing off the ‘wonders of the heavens’ through their telescopes. But they know that most people don’t see what they see, and lose interest after a few looks at the Moon. Why is this? Telescopes have a pretty small FOV, less than binoculars. While most people can’t put a label on their disappointment looking through a telescope, it is almost certainly the field of view. VR and AR suffer a similar problem, despite a much higher FOV. A world, whether astronomical or virtual, is interesting in itself, not the boundaries of the viewing device. Until the boundaries disappear from inspection (meaning you move your eyes) VR and AR hardware may not get the growth in the consumer market described above. Instead of 110 degrees, the FOV really needs to be closer to 200, though the edges could be a bit blurrier than the center and still maintain the effect. The current 4k pimax is similar in features to the Oculus and Vive. In contrast, The 8k design appears to be two smartphone rather than one, giving that magic 200 degree FOV. The devices are demoed at GDC 2017 with some rave reviews. In conclusion, hardware needs to improve the VR experience to get the sales IDC and others are predicting. 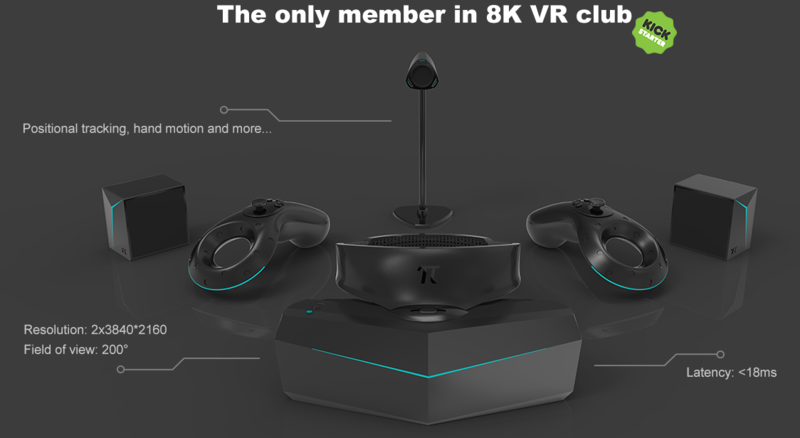 Since so many vendors are working at re-inventing the wheel with low-end devices, the current slump in VR might presist until the 8k spec headsets begin to appear.